An abbreviated wheelbase combines with a snappy engine and a centered driving position to make the RS1 fun to toss around. Pro Moto Billet has been an innovator in off-road for many years. It started with billet parts, added Fastway to the stable, and now has brought its own brand of innovation to the UTV market. Its signature UTV part is a truly exceptional mirror set with powerful built-in lights that illuminate ahead and to the side. Do we have lights available? Or mirrors? 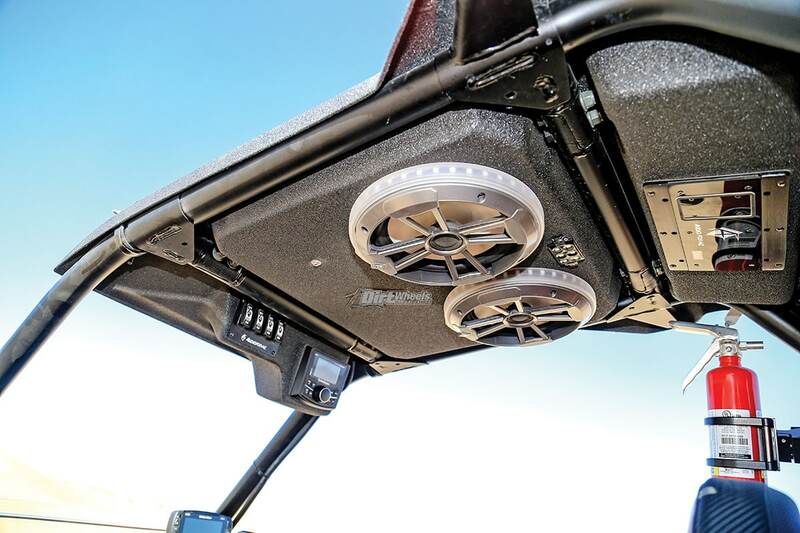 Certainly, but Pro Moto Billet’s UTV arm, Sector 7, is combining both in a quality, innovative package. PMB is a family company, and when it came time to add another UTV to the company/family stable, it was decided that a UTV that was unique and different would be just the ticket. Audio Formz makes the slick-fitting roof that allows a complete audio system to be mounted without messing with the dash. That UTV turned out to be the 2018 Polaris RS1 single-seater. We saw the machine in its first stage at a trade show and knew we wanted to try it. Graphics from UTVFX Graphics make this a real stunner in person. Add in the Double OTT UTVA clear door fillers and half windshield and the Audio Formz roof, and you have a very cool-looking machine. When we first saw it, it had GMZ Gunslinger beadlock wheels fitted with GMZ’s Ivan Stewart Edition 32-inch tires. That rolling stock made the car look super serious and trail-ready. Unfortunately, our opportunity to try the machine did not coincide with dirt trails suitable for that tire and wheel setup. Instead, we planned a meet at Glamis during Camp RZR. No problem, the machine had a set of MSA Battle wheels with EFX Sand Slinger tires stored away waiting for just such an occasion. Just what we ordered for a weekend Polaris party. The stock RS1 combines the heart and soul of Polaris’s best-selling RZR XP 1000 wrapped in a shortened, slimmed-down single-seat package. 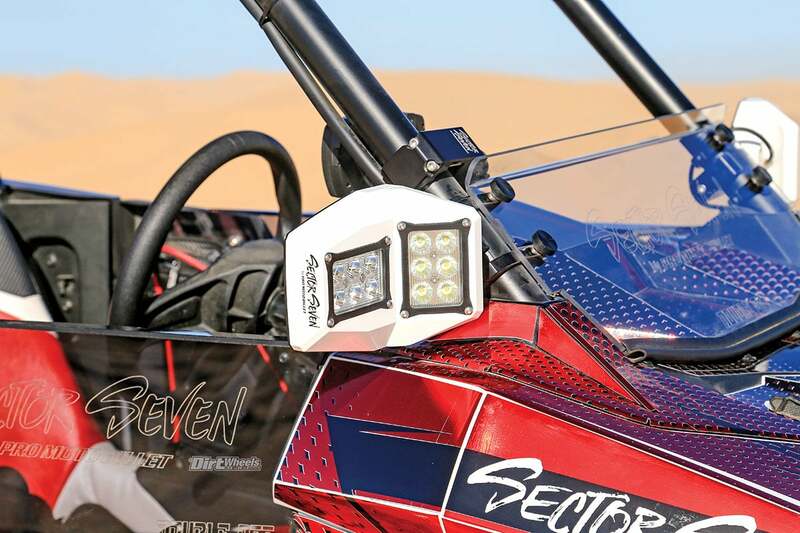 Sector 7’s Sector light mirrors are fabulous mirrors that are easy to use, but the integrated LEDs throw huge light forward and to the side. 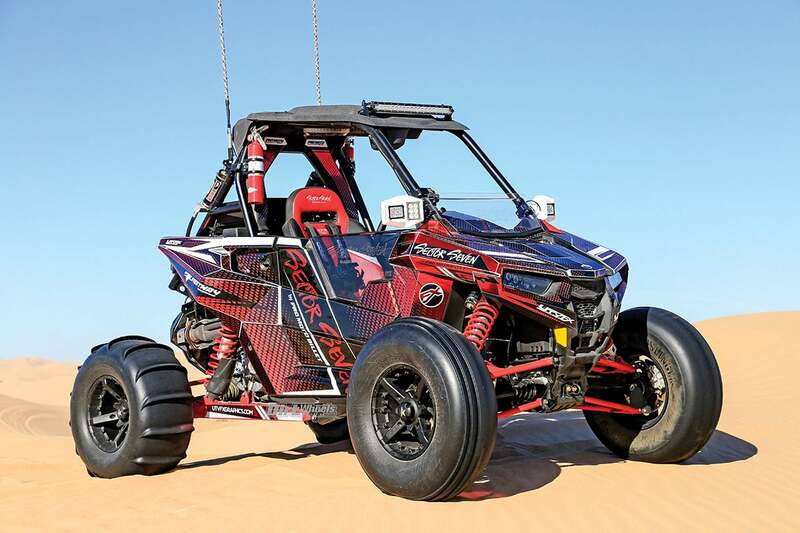 Polaris obviously had short-course racing in mind with this model, but we saw plenty of these machines at the Imperial Dunes (Glamis) during Camp RZR. A goodly number were traveling in pairs. When we first drove the RS1, we assumed that many people would use the compact size and reasonable price for an excuse to buy two RS1s rather than a single, higher-spec two- or four-seater. That is the perfect solution for brothers or couples where neither person wants to spend any time in the passenger seat. As much as we embrace the RS1 concept, the execution is a bit Spartan. Sector 7 took care of that in a big way. The Double OTT UTVA parts certainly help the car feel more finished and secure. Plus, with the etched, smoked polycarbonate upper door sides, the car has the look of luxury. 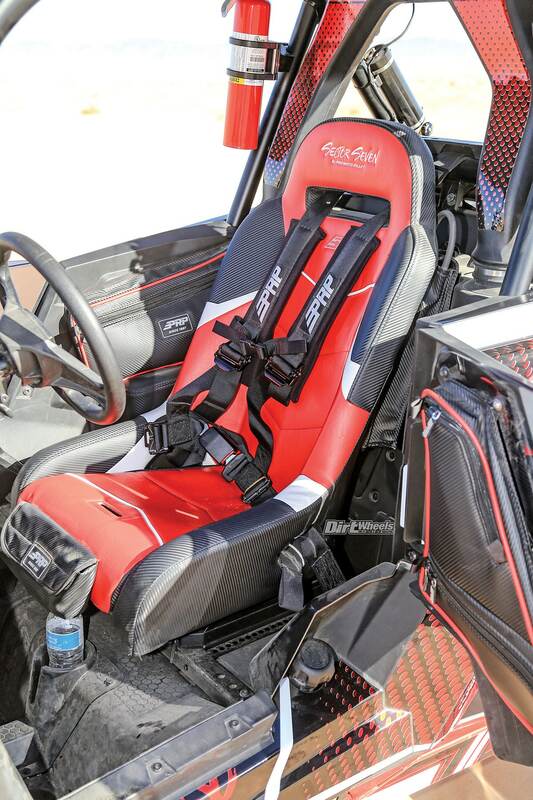 PRP’s custom suspension seat and seat-front bag mate with the harness to make the interior comfy and safe. When looking for a upscale feel, Sector 7 relied on PRP. PRP supplied the custom-embroidered GT3 suspension seat with a seat-front storage bag. The seat mates with a secure-feeling PRP harness with sewn-on pads. Added comfort and a plush feeling come from the PRP RS1 door bag and armrest set. Every place you come in contact with the machine, it is padded rather than unyielding plastic or steel. Finally, there is the Audio Formz roof. This is a fine-fitting nicely shaped roof, but there are multiple options for mounting a sound system into the roof itself. With the system in the roof, the only thing needed is to connect the roof to power. This is a slick arrangement. Door bags add handy and ready storage options in an interior without much room. They also add welcome padding to the door sides. Then there are the Sector 7 products from Pro Moto Billet. The most noticeable are the Spectrum Light mirrors. They are painstakingly engineered and whittled from blocks of aluminum. Since it was daytime, the first thing we noticed is that the slightly convex mirror glass makes for a mirror that gives an amazing view to the rear. Then we got to use them at night on a machine with otherwise stock lighting. The difference the lighted mirrors makes is amazing looking forward and to the side. The mirrors adjust easily but stay in adjustment despite rough terrain and aggressive driving. Sector 7 also mounted up its quick-release fire extinguishers and billet flag mounts for the Whip It Light Rods. 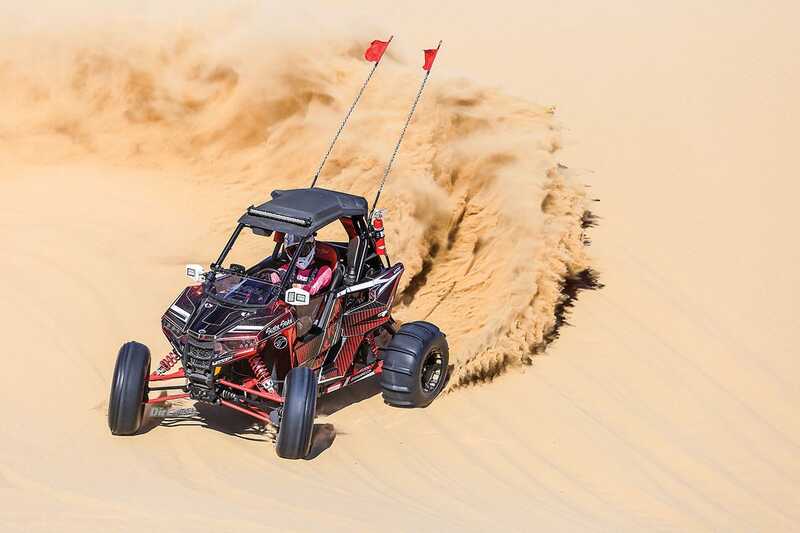 When you need power to drive up hills into turns, the motor that the RS1 shares with the RZR XP 1000 is up to the task. We would certainly have liked to get some seat time in the Sector 7 RS1 on dirt trails, but we had a blast in this machine in the dunes. 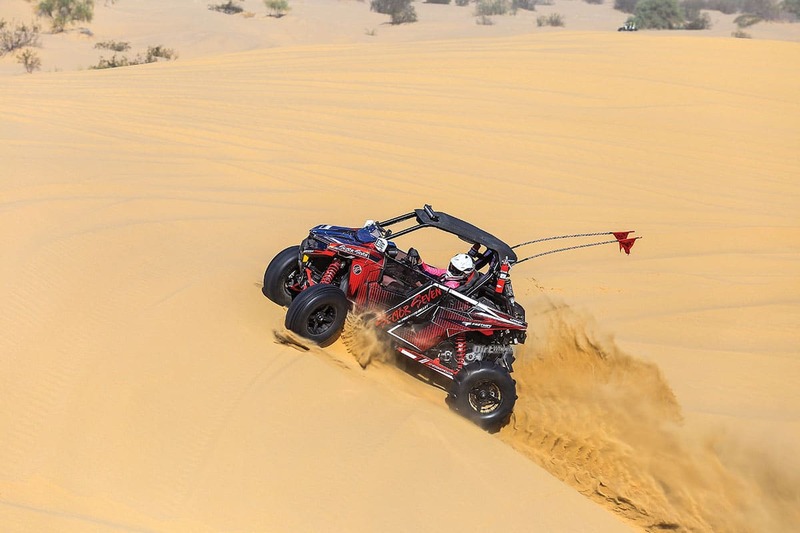 We were jumping back forth from our 2019 Polaris RZR XP 4 Turbo S to the RS1. 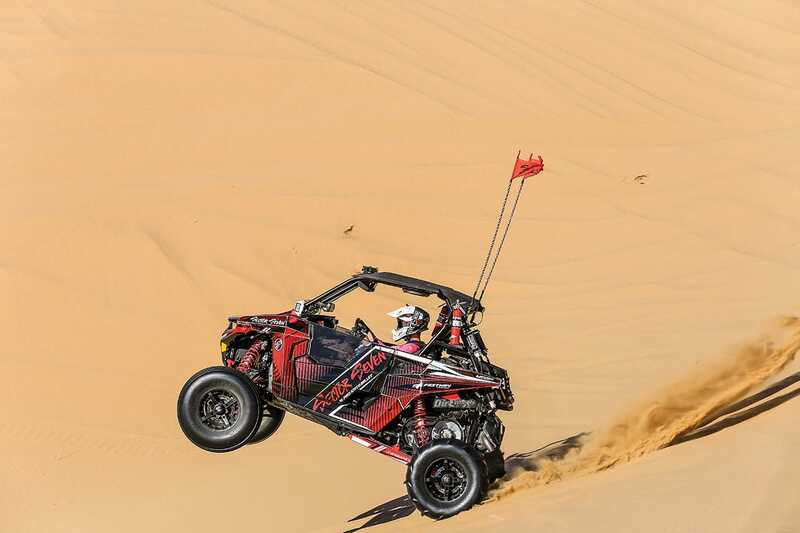 Basically, we were transitioning between the pinnacles of RZR performance to what is arguably one of the most basic of Polaris sport models. Even given that large jump, the Sector 7 RS1 was plenty of fun. Polaris’ normally aspirated 1000 engine has a strong but usable and effective lunge when you stab the throttle. Sand Slinger paddles make sure that the initial lunge isn’t wasted. 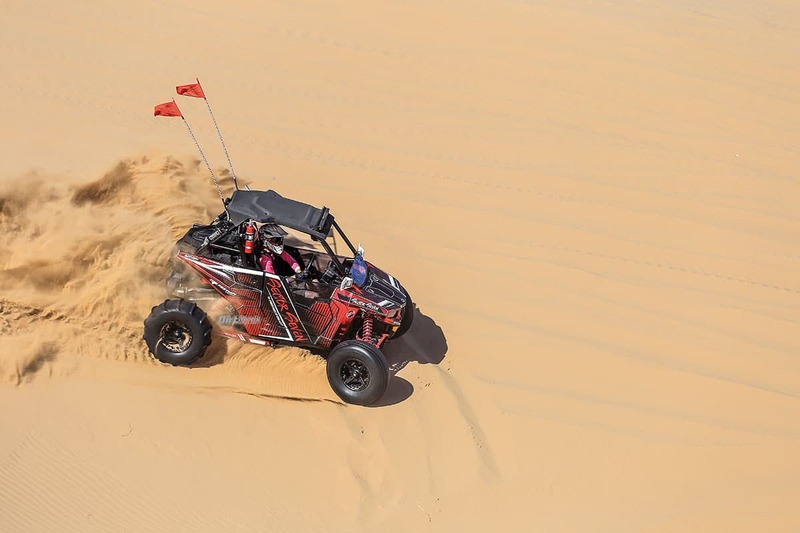 Even with what Polaris considers a basic suspension package from Walker Evans, the RS1 offers a comfortable ride with plenty of control to ride the rough and those sudden G-out impact transitions that are part of dune life. You would think that a compact car like the RS1 would be fussy about fast corners, but it remained planted and controlled. As you might imagine with the RS1’s abbreviated wheelbase, this is a machine that can change directions in a hurry. That was the case with the Sector 7 machine. It offered a secure feeling at speed yet is super nimble. 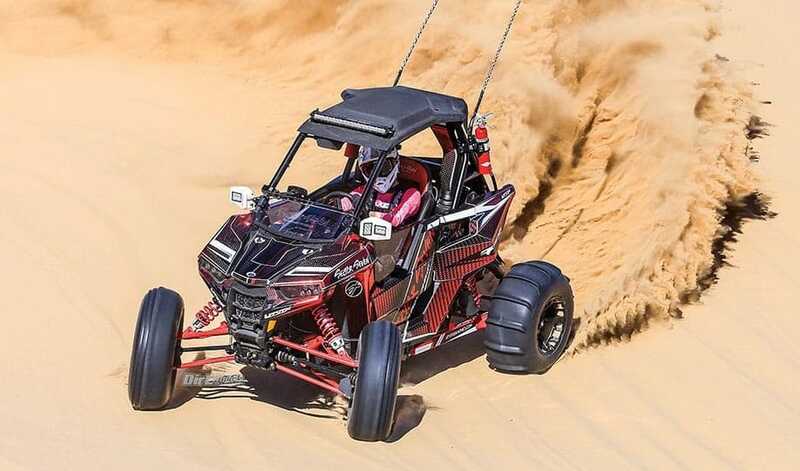 Because the driver is centered in the machine, his feet extend between the wheel wells, so the shorter machine has greater legroom on the left than a two-seat or even a four-seat RZR. These machines are prized for playing on tracks, and after driving this machine we can see why. It jumps easily and with control. Finally, we just enjoy looking at this machine. Photos do not completely do the red chrome graphics justice. This is one striking machine. This isn’t a wrap but a graphics kit like a motocross motorcycle uses. They are tough and should last well. The EFX Sand Slinger tires lived up to the name in spades. We like the open look that the MSA wheels offer. We are sure that suspension and engine performance mods are in the future for this RS1. We hope that means that we get a chance to pilot this machine again, but this time on some tight and snaky trails. For now, Sector 7 can enjoy the drive or simply sit and look at this beauty. We know which we would do. Bring on the miles and hours on the trail. 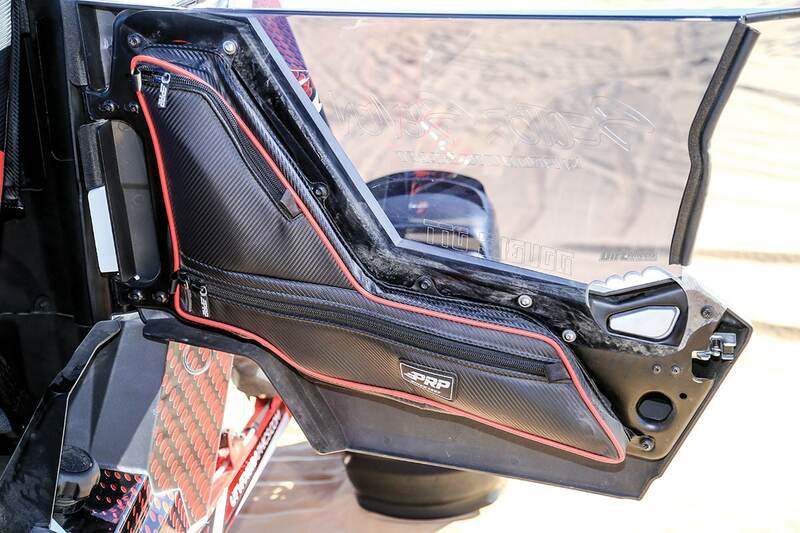 Between the Double OTT products and the UTVFX graphics, the Sector 7 RS1 is a real looker with a lush interior. Ivan Stewart edition 32-inch tires $229.95 each. THE NEW MAY 2018 ISSUE IS HERE!